The cult BBC series Dead Ringers finally slides onto DVD in Australia that features some of the UK's best impersonators in this thoroughly entertaining and over the top series. Impersonations include the president of the United States of America, George Bush, Tony Blair, the prime minister of the United Kingdom and home grown talents such as Russell Crowe and Rolf Harris. Presented in high quality 16:9 widescreen and Dolby Digital 2.0 stereo, Dead Ringers Series One is pure quality on DVD but unfortunately it lacks in the extras department with an entertaining but short pilot episode and a sketch selection. 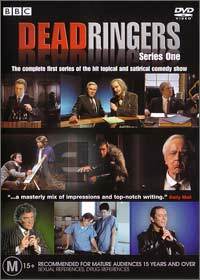 In conclusion, Jon Culshaw truly steals the show in Dead Ringers that contains some of the best impersonations to date, Schwarzenegger, Robbie Williams and Tom Baker are just a few of the greats that grace this entertaining DVD series. Recommended!